I like chicken. I like pizza. But I never really liked the idea of mixing the two. I think it was based on a bad frozen pizza I had as a child. But one day when Jason lived in Baltimore, we ended up eating at a place called Joe Squared. Maybe it's owned by two people named Joe? 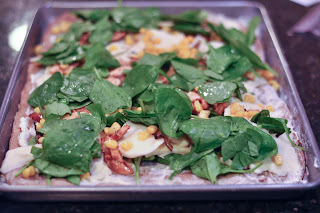 I'm not sure, but we were there with a friend and the guys decided they wanted this BBQ chicken pizza. I didn't want to be a naysayer, so went against my instincts and ordered it and I ended up finding my favorite pizza. I'm not a pizza connoisseur per se, but their pizza is so good that whenever we go to Baltimore, I never want to get anything new and just want this pizza at Joe Squared. Their thin crust with just a little bit of charred bits is something I have not figured out how to replicate, but I did my best to imitate the pizza toppings themselves. Honestly, I just let Trader Joe's pre-made crust rise for a few hours then roll it out as thin as I can, because making things with yeast intimidate me. 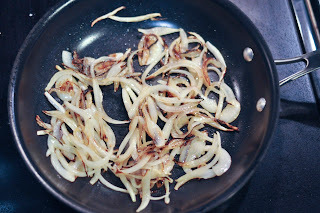 This is one of my few recipes not originally from a cooking blog (ie: the Smitten Kitchen), so I figured I'd share mine and at the very least you now know where you can go in Baltimore for the original, better version. I think the real secret is the white sauce. I actually didn't have parmigiano cheese that original white sauce recipe calls for, but it turned out fine. Plus, I thought it would have been a bit too cheesy to have the sauce cheesy and cheese on top. The quantities for everything else are rough estimates, and the nice thing about pizza is you can kind of put your own spin on it really easily. Please forgive the quality of the "after" picture. It was so good that I forgot to take a shot the night we baked the pizza, so this is lunch at work the next day. The avocados and spinach were really much more green when it was fresher. At least the light is better than it would have been. Make or prep pizza dough according to your own methods or package instructions. 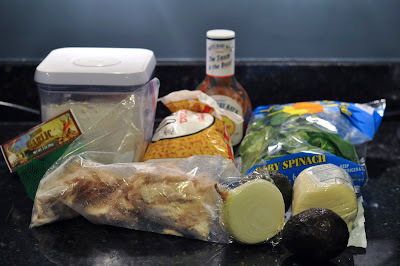 With the chicken in an oven-proof dish, mix in enough BBQ sauce to cover it and put it in the oven while you are working on everything else (chopping avocado, making white sauce and caramelizing the onions, about 15-20 minutes). 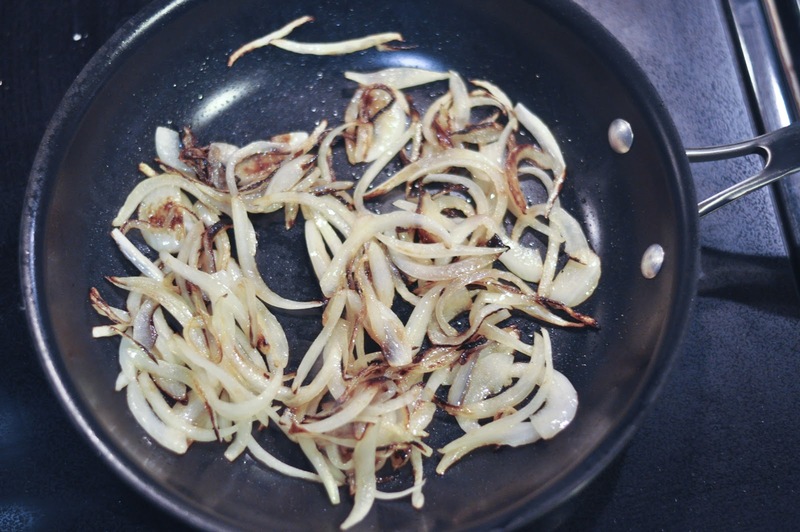 Slice the onions, then caramelize them by adding them to a pan over medium heat with a little oil, stirring occasionally until they get nice and browned. Everything else you can just add after putting the white sauce on the pizza dough. I like to put the spinach on before the cheese, otherwise it falls off/apart more easily. 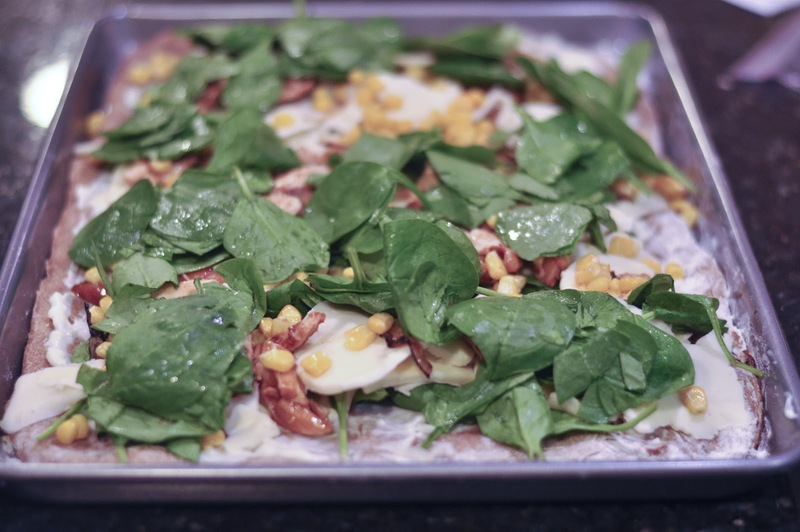 If you are using frozen corn or spinach, it works better to cook them first, or the pizza gets a little watery as the vegetables thaw. Cook according to directions on crust (usually 450 degrees for about 20-30 minutes). Yum. Quick! I need to post cherry blossom pictures while they are still seasonally relevant! For a few weeks every April the DC area is in a frenzy over the beautiful cherry blossoms, the most famous of which line the Tidal Basin. It can get pretty crowded but really is pretty. Jason has been gone for the past eight weeks. I'm pretty excited to have him home. But at least now my countdown is in hours not weeks! I think this is the first time away that we've actually been married and not just dating. It definitely was harder after being married, but I found God gives you just enough grace for the situation He's put you in. Not any more, not any less. On the plus side, I barely had to go grocery shopping, and I got to watch whatever TV I wanted, which included an entire season of Downton Abbey and Top Chef. Jason laughs that all I do while he is gone is shop and eat. Of course, he thinks this because it is kind of true. (I have some weird form of OCD that compels me to never leave Anthropologie without buying a dress. It's like an addiction. I usually return it later. Also, I did eat out a lot, but mostly because I was using the time he was gone to hang out with girlfriends, and most of my friends get as excited about food as I do.) However, eating and shopping isn't all I do. I tried to take advantage of his time away to get some projects done (like LASIK). My overly ambitious checklist included taking our car to the shop, organizing, cleaning, freezer meals, wedding album, taxes, consign my wedding dress, other home repairs and instagramming everything I actually finished. The first big project was painting the bathroom and selecting a photo for the photo to canvas groupon that I decorated the bathroom with. The original blue wasn't too bad, but also didn't flow as well with the other repainting we've done. I've had the paint since last July, and when I got a day off work for the "snow storm," I figured if I didn't do it now, I never would. It's Duron HGTV line called Ethereal Mood. I actually wasn't too happy with the quality of the paint itself. The coverage doesn't seem the best and it has already scratched in some places, revealing the old color underneath. However, I suppose you get what you pay for, and I do think the color goes well with the other grey and blues in the house. As for the photo-to-canvas, it sounds easy, but since I didn't have a picture in mind, it took me a while. I had to narrow it down out of the thousands we've taken over the last two years alone, try to figure out editing software enough to enhance it a bit, before just uploading it and buying it. I picked a photo from our recent Africa trip and am happy with the color it adds to the bathroom. I ended up replacing the shower curtain rod once I took the old one down, so I even got to use power tools! I now understand why Jason ends up with so many holes in the wall when he's hanging things. (Let me tell you, it was less fun trying to do it at 11pm just so you could shower before a 7am commitment the next day.) I actually have a few more ideas for the bathroom in mind, but that'll have to happen next time Jason is gone. The other big project that I barely finish before he gets home also involved painting. I know not everyone feels this way, but I am a fan of modern abstract art.. think Mark Rothko's color fields. I know a common comment on that type of art is, "My five year old could do this." And while I still think it has more meaning than a five year old puts into a painting, I used to agree that it didn't seem too hard to do. I mentioned this to Jason as we started to set up our new home after our wedding, and he surprised me with a giant blank canvas for Christmas that year. That was over a year ago, and it was time to face my intimidation of such a big canvas. Thank you to everyone's kind comments on my instagram picture. If I learned anything from my painting projects is that I still have a lot to learn. 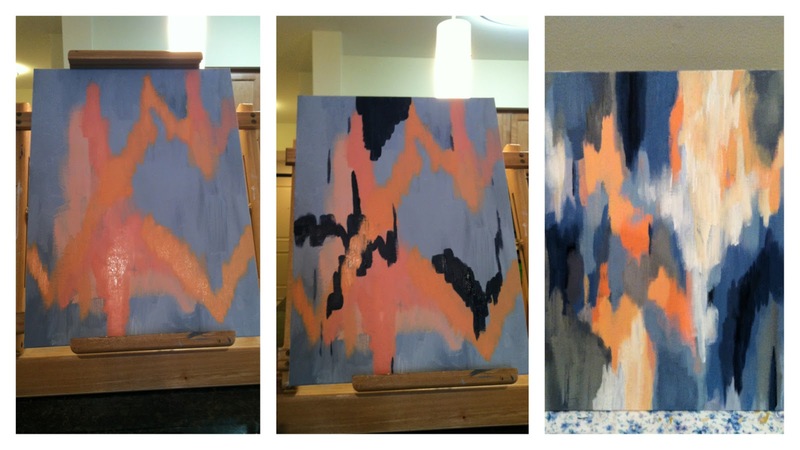 The two paintings ended up with pretty similar patterns, so I'll have to branch out next time. I've never really done any painting or drawing besides as a ten year old, so it still turned out better than I expected. It was fun though and now that the creative juices are flowing (or maybe just slowly dripping), I'm seeing ideas and inspiration everywhere and hope to keep up the hobby. I'm probably not going to get anything else on my list checked off before Jason comes back. Getting groceries and laundry might be all I can handle, but at least I've got the painting done after a year of "meaning to." As nice as getting some projects done, spending time with people you care about is way better than crafts. Plus, I need him to come home because I have jars that I haven't been able to open for the last two months.